We are dedicated to providing you with the pure joy that comes with flying. We are sky lovers, thrill seekers and people who believe that jumping is freedom. We believe fitness can be fun and play can be smart. We are healthy and bursting with energy. We fly high and keep it safe. We are Sky Zone Timonium. Sky Zone Timonium works hard to keep you and your loved ones safe. Our trampoline materials are top of the line and meticulously maintained. Every aspect of the park is there to allow everyone the best time possible while keeping you safe! 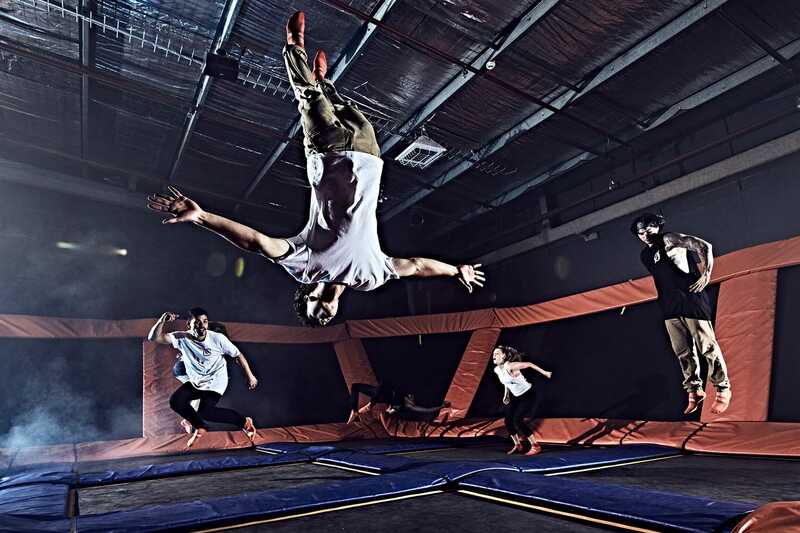 Sky Zone is the world's first indoor trampoline park, so our parks are second-to-none. We have TWO ultimate dodgeball courts, Skyjoust, and a nerve-racking Warrior Course…and much more!! Dedication to guest service is one of our main priorities. Our staff likes to get into the fun, so watch out! They may pull you into a line dance in the lobby or simply give you that last bit of encouragement you need to finish the Warrior Course! You will leave the park saying WOW, what an experience! Sky Zone Timonium is proud to be a member of the Timonium community. We are invested locally in your schools, sports teams, and businesses, all in an effort to help stimulate the Timonium economy. Please e-mail timonium@skyzone.com for more information! Sky Zone Timonium has part-time opportunities inside our giant indoor trampoline park! If you think you live and breathe FUN, and want to work inside of a business that is pure FUN, we'd like to talk to you! Open interviews are hosted every Friday at 4:00pm. ON SITE SECURITY ALL NIGHT! ONLY 1 of the above ticket Perks may be redeemed per day. · *Valid waiver and Photo of pass holder required. This Pass is only redeemable by 1 pass holder and cannot be shared. Not valid during Glow Zone. Toddler Time is a period of time, for children four years of age and under, to have courts dedicated to their use. Parents are allowed to monitor the children on the trampoline as long as there is a valid waiver for the parent and they purchase Sky Socks. It is important to note that for the parents it is not considered a period of open jump. The safety of the children is our number one concern. Our policy is as long as you can walk then you can jump! Also, every jumper needs to complete a liability waiver at each Sky Zone location. If you are under the age of 18, your parent or legal guardian must fill the waiver out for you, but does not have to be present when you visit the park. Waivers can be filled out online, or at the park. Each Sky Zone requires separate waivers due to all being independently owned. As a Parent Can I Jump With My Child? We do age and size separate for the safety of all guests, A (0-4yrs), B (5-10yrs), C (11-15yrs) & D (16yrs+) Children and parents may jump next to each other at sky slam and foam zone. However, parents and small children may not play dodgeball together. However, we do offer a free Parent Pass for parents with kids under the age of 4 or kids who require special needs. A Parent Pass grants you access to the pads surrounding the trampoline your child is jumping in, as long as the parent has a valid waiver, and a pair of Sky Socks. If you are looking for a more intimate time with your child who is 4 years old and younger please check out our Toddler Time. Can I Use Passes From Other Sky Zones? Unfortunately no, Sky Zones are independently owned branches of the corporation. All coupons must say Sky Zone Timonium to be used at the Timonium location. Yes, we offer a 10% discount to service members with a valid ID. This discount is only for the member of the service and immediate family. Thank you for your service! Absolutely! Our group rate starts at 15 jumpers, and is dependent on how long you want to jump, and what kind of organization it is. Our call center staff can start the process of assisting you. The number is (410) 842-1661. Are Hard and or Soft Casts allowed on Trampolines?